This movie is very similar thematically with Del Toro's earlier film, The Devil's Backbone. Both films are intensely realistic looks at the horrors of the Spanish Civil War. Both films contrast the intense realism with splashes of intense fantasy. Both films are about child protagonists trying to deal with reality and fantasy simultaneously, and using one to solve problems in the other. Both films feel very similar. And they're both very good. Pan's Labyrinth takes place in a remote wooded mountainous area, where young Ofelia and her very poorly pregnant mother Carmen are sequestered at the behest of "The Captain," Carmen's second husband (not Ofelia's real father). Nearby the chateau where they all live is an ancient stone labyrinth where Ofelia stumbles upon a Faun who, oddly enough, never introduces himself as Pan (the original Spanish title of the movie translates simply as "The Faun's Labyrinth." I don't know where "Pan" came from). The Faun believes that Ofelia may have an important connection to a mystical underworld, and so sets Ofelia on a series of quests/tests. All this is set against the backdrop of Carmen's deteriorating health. The doctors advised that she not be moved so late in her pregnancy, but "The Captain" insisted that his son would be born wherever "The Captain" was. Meanwhile, "The Captain" is obsessed with finding the rebel commie scum that is hiding out in the mountains. "The Captain" is a very evil man. This is NOT a movie that is appropriate for children. It is rated R, and for good reason. The horrors of fascist crimes of war are not flinched away from, and neither are the horrors in the fantasy world. They're both often very, very gross and very graphic. And they're all really, really well done. I'm of two minds about this movie. It is so beautifully made, and all of the performances (especially Sergi López as Captain Vidal and Doug Jones as basically anything humanoid in the fantasy segments) are very gripping. The special effects are excellent for the most part. And yet for some reason it failed to move me as much as it seemed to want to. I can't put my finger on why not, and I find that very frustrating. All of the elements are there for a four-star film, and yet when all was said and done I did not have the sense of catharsis that is necessary for me to give a film four stars. Pan's Labyrinth just kind of was. I enjoyed it thoroughly, but something in the way the story was constructed or told prevented it from becoming completely absorbing. I can't quite wrap my brain around why the film was made. What is its purpose? It seems to truly want to be something more than just sheer entertainment, but it just didn't deliver much else for me, and I think that's why it feels ½ star empty. 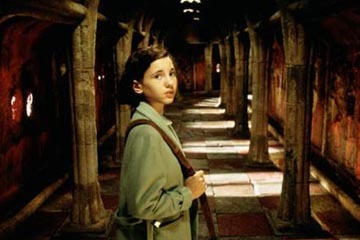 But I highly recommend Pan's Labyrinth because it does that thing that my favorite movies all do: It showed me something I would never have been able to see anywhere else.